Using archival data from the Sloan Digital Sky Survey, and the XMM-Newton and Chandra X-ray telescopes, a team of astronomers have discovered a gigantic black hole, which is probably destroying and devouring a massive star in its vicinity. With a mass of 100 million times more than our Sun, this is the largest black hole caught in this act so far. The results of this study are published in a paper in the journal Monthly Notices of the Royal Astronomical Society. Andrea Merloni and members of his team, from the Max-Planck Institute for Extraterrestrial Physics (MPE) in Garching, near Munich, were exploring the huge archive of the Sloan Digital Sky Survey (SDSS) in preparation for a future X-ray satellite mission. 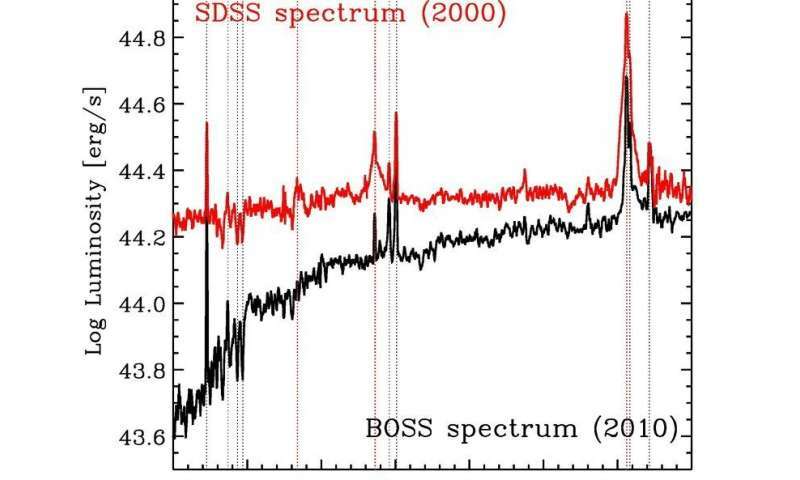 The SDSS has been observing a large fraction of the night sky with its optical telescope. In addition, spectra (where light is dispersed across wavelengths, allowing astronomers to deduce properties like composition and temperature) have been taken of distant galaxies and black holes. For a variety of reasons, the spectra of some objects were taken more than once. And when the team was looking at one of the objects with multiple spectra, they were struck by an extraordinary change in one of the objects under study, with the catalogue number SDSS J0159+0033, a galaxy in the constellation of Cetus. The huge distance to the galaxy means that we see it as it was 3.5 billion years ago. "Usually distant galaxies do not change significantly over an astronomer's lifetime, i.e. on a timescale of years or decades," explains Andrea Merloni, "but this one showed a dramatic variation of its spectrum, as if the central black hole had switched on and off." This happened between 1998 and 2005, but nobody had noticed the odd behaviour of this galaxy until late last year, when two groups of scientists preparing the next (fourth) generation of SDSS surveys independently stumbled across these data. Luckily enough, the two flagship X-ray observatories, the ESA-led XMM-Newton and the NASA-led Chandra took snapshots of the same area of the sky close in time to the peak of the flare, and again about ten years later. 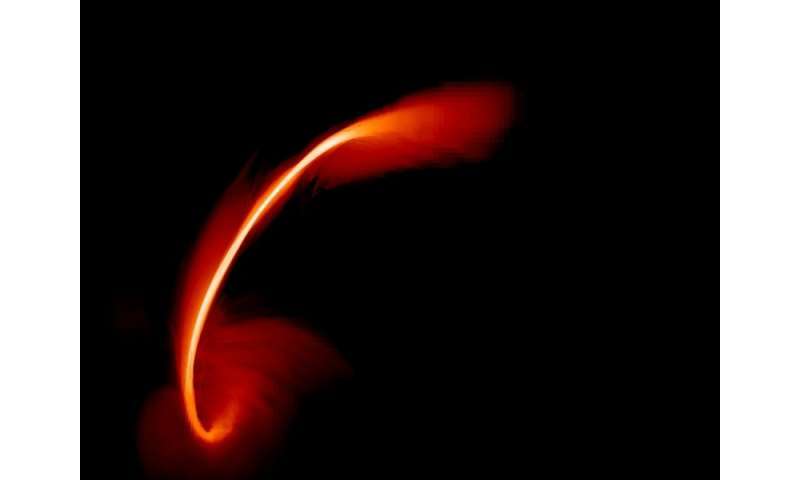 This gave the astronomers unique information about the high-energy emission that reveals how material is processed in the immediate vicinity of the central black hole. Gigantic black holes are at home in the nuclei of large galaxies all around us. Most astronomers believe that they grew to the enormous sizes that we can observe today by feeding mostly on interstellar gas from their surroundings, which is unable to escape the immense gravitational pull. Such a process takes place over a very long time (tens to hundreds of millions of years), and is capable of turning a small black hole created in the explosion of a heavy star into the super-heavyweight monsters that lurk at the centre of galaxies. However, galaxies also contain a huge number of stars. Some unlucky ones may happen to pass too close to the central black hole, where they are destroyed and eventually swallowed by the black hole. If this is compact enough, the strong, tidal gravitational forces tear the star apart in a spectacular way. Subsequently bits and pieces swirl into the black hole and thus produce huge flares of radiation that can be as luminous as all of the rest of the stars in the host galaxy for a period of a few months to a year. These rare events are called Tidal Disruption Flares (TDF). Merloni and his collaborators quite quickly realised that 'their' flare matched almost perfectly all the expectations of this model. Moreover, because of the serendipitous nature of the discovery, they realised that this was an even more peculiar system than those which had been found through active searches until now. With an estimated mass of 100 million solar masses, this is the biggest black hole caught in the act of star-tearing so far. However, the sheer size of the system is not the only intriguing aspect of this particular flare; it is also the first one for which scientists can assume with some degree of certainty that the black hole was on a more standard 'gas diet' very recently (a few tens of thousands of years). This is an important clue to finding out which sort of food black holes mostly live on. "Louis Pasteur said: 'Chance favours the prepared mind' - but in our case, nobody was really prepared," marvels Merloni. "We could have discovered this unique object already ten years ago, but people did not know where to look. It is quite common in astronomy that progress in our understanding of the cosmos is helped by serendipitous discoveries. And now we have a better idea of how to find more such events, and future instruments will greatly expand our reach." In less than two years' time a new powerful X-ray telescope eROSITA, which is currently being built at MPE, will be put into orbit on the Russian-German SRG satellite. It will scan the entire sky with the right cadence and sensitivity needed to discover hundreds of new tidal disruption flares. Big optical telescopes are also being designed and built with the goal of monitoring the variable sky, and will greatly contribute to solving the mystery of black hole eating habits. Astronomers will have to be prepared to catch these dramatic last acts of a star's life. But however prepared they'll be, the sky will be full of new surprises.